The other night, Kara and I were picking up a few items at Target. It was getting close to dinner time, so we decided to grab a bottle of wine to go with our meal. The wine section of Target is not that big. It’s not big at all. I was in that wine vortex. I didn’t want to pay too much. I also didn’t want to come home with crap. I found myself picking up a whole bunch of bottles, just to put them right back down in frustration. I wanted to pick the perfect wine. 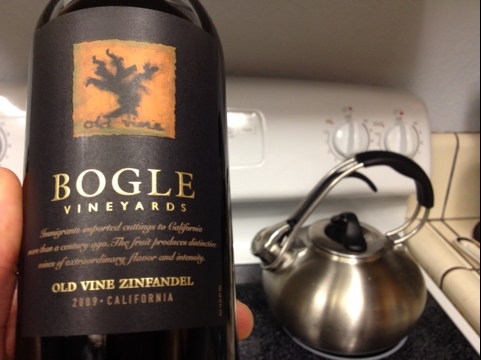 We picked up the Bogle 2009 Old Vine Zinfandel for 11 bucks. You should be able to find this one anywhere. I grabbed it because Bogle, as big as they are, makes consistently good wine at a fair price. Nothing to brag about to your wine friends. Color: The Bogle Zin has a dark strawberry red color. So far, so good. Nose: Nice fruit aromas of blackberry, plum and cranberry. Nice and chalky, with a subtle hint of vanilla and oak. Nice. Taste: This is my jam! Bike tires and plums up front. Good acidity of grapefruit zest. This Zin has an alcohol content of 14.5%, but you’d never tell by taste. The Bogle has mad balance. Score: I was really impressed with the quality of fruit, acid, and mouthfeel on this wine. At 11 dollars, I can’t think of many other Zinfandels at that price point that could compete with this Bogle. 89 points. Because I know this wine is can be found all over the place, and because of its price, I’m recommending that all of you give it a try. This entry was posted on February 26, 2012 at 12:23 pm and is filed under Uncategorized. You can follow any responses to this entry through the RSS 2.0 feed. You can leave a response, or trackback from your own site. Just went to Bogle winery in Clarksburg a couple weeks ago. Cool spot!